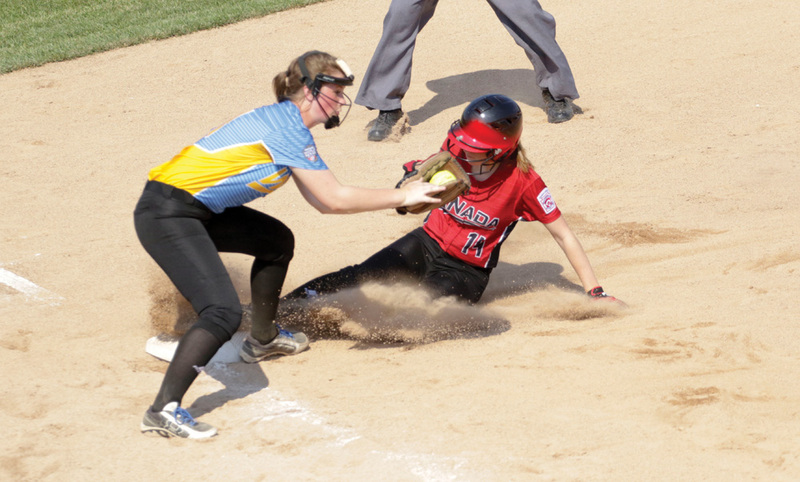 Canada’s Emma Rautio-Roe slides into third against West’s Natalie Goodman during last year’s Senior League Softball World Series. The eyes of the Little League world will descend upon Sussex County beginning Monday, July 30, as 10 teams will vie for the 2018 Little League Senior League Softball World Series championship at the Pyle Center in Roxana. This will be the 15th year in a row that Lower Sussex Little League will be the host site for the international tournament for 13- to 16-year-old girls. “Little League never changes these things unless the host sites don’t want to do it anymore,” explained Martin Donovan, tournament director for the Little League Softball Senior League World Series. “This is a wonderful showcase for the county, and it is a chance for us to showcase our kids. It really is a fun event for everyone. Local Senior League softball teams do have a slight advantage in getting into the World Series, as the host district is guaranteed a spot in the Series. But teams within host District 3 still have to win the district title in order to play in the world championships. Defending Senior League champion Georgetown, fresh off its District 3 title, is back with high hopes of recapturing the glory and excitement they created last year. Georgetown is returning six girls from last year’s squad, including pitcher Taylor Wroten. Wroten, a senior to be at Sussex Technical High School, is fresh off of helping Delaware South win the Carpenter Cup softball showcase tournament in Philadelphia. She is joined by fellow returnees (and Sussex Tech teammates) Kylie Kruger, Kelsey Kormanik and Sierra Livingston. Delmarva Christian High School’s Jordyn DiFava and Cape Henlopen High School’s Ryleigh Elliott are the other two returnees. The newcomers include Sussex Tech’s Kayla Evans, Hadlie Jarvis and Amanda Coates, and Sussex Central’s Skylar Webb and Macy Layfield, along with Delmarva Christian’s Siera Jones and Malaurie Noble. As of Coastal Point press time on Wednesday, six Senior League teams — including Georgetown — had punched their tickets, and were on their way to Roxana. The Europe/Africa region representative will be the Netherlands, from Rotterdam/The Hague. The Asia Pacific representative is from the Philippines, by way of Tanauan City. The Central representative is from Ft. Wayne, Ind. The Southeast representative will be coming from Ft. Myers, Fla., and the Latin America representative is from Puerto Rico. Games will be played at the Pyle Center Complex in Roxana beginning Monday, July 30, at 6 p.m. Host Georgetown will open up their play against the East, on Bruce Layton Field. Canada will square off against the Southeast on the Connie Mack Field. Following those games, around 8 p.m., will be Central versus West, on the Layton Field, and Latin America against Southwest, on the Connie Mack field. On Tuesday, July 31, action begins at 3 p.m., with West versus Canada (Layton) and Southeast against Central (Connie Mack). At 5:30 p.m., Latin America and Asia Pacific will square off on Layton Field, while Southeast and Europe/Africa will battle on Connie Mack. Closing out Tuesday’s full slate will be the East versus Asia Pacific (Layton), and Southwest against Georgetown (Connie Mack). There will be early games on Wednesday, Aug. 1, with Europe/Africa taking on the West at 10 a.m. on Layton, while Canada meets Central on Connie Mack. Following those games, at 12:30 p.m., Georgetown will face Latin America on Layton, and Asia Pacific battles Southwest on Connie Mack. Wednesday night is “party night” for the teams and their players. It will provide an opportunity for the girls to mingle with each other after battling it out on the fields. In addition to the Senior League games, the complex will also host the Pat Knight tournament for 8- to 10-year-olds on the back fields during the week. There will also be a Challenger Division exhibition game taking place that Wednesday evening.